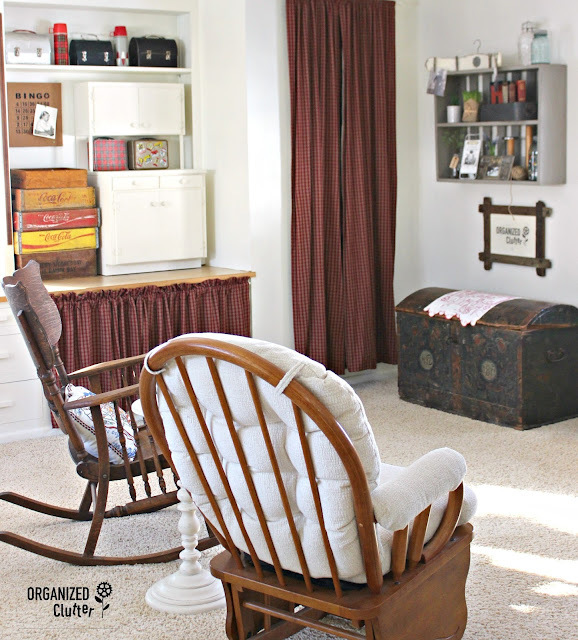 Sadly, my den had become a junk room, littered with craft supplies, thrift shop finds, blog props and STUFF. It needed an intervention. 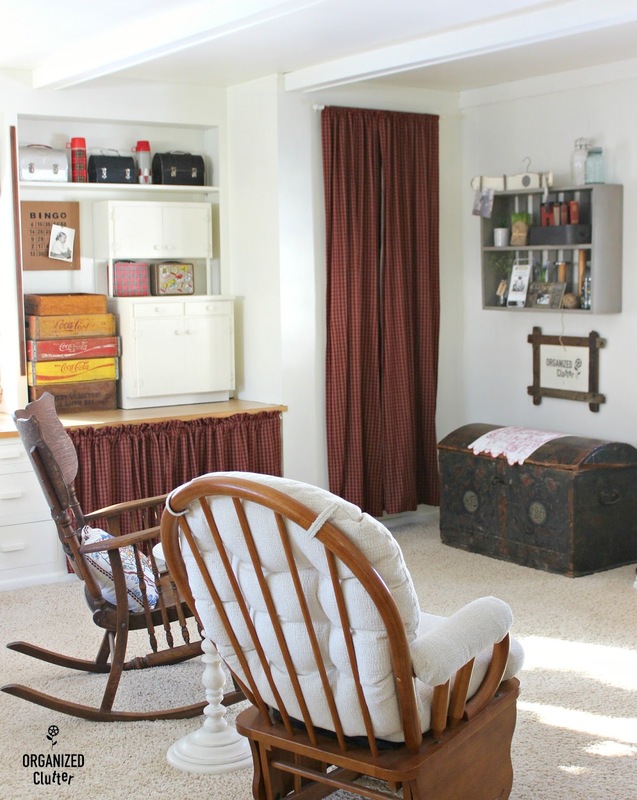 Because the room is quite large, I am transforming it into a craft room, den and guest room. I painted the walls Dover white eggshell paint. 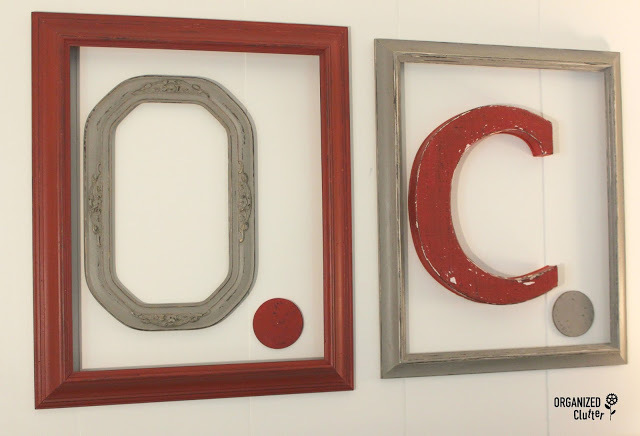 I made several projects over the fall months, like this thrift shop frame project. 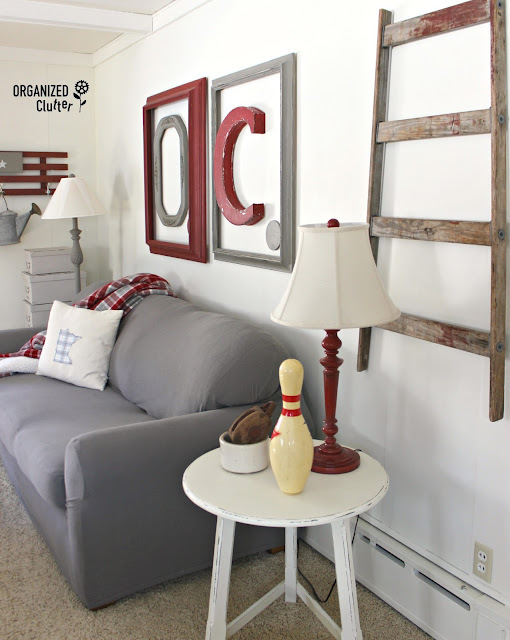 The initials stand for Organized Clutter. 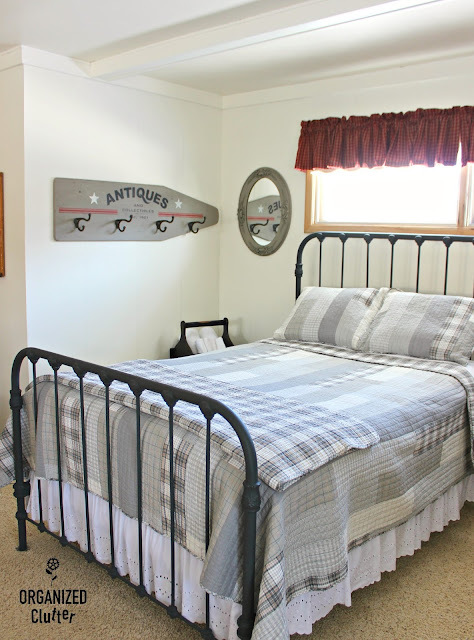 I added hooks, paint and Old Sign Stencils to an old ironing board for hanging clothes in the guest room section of the room. 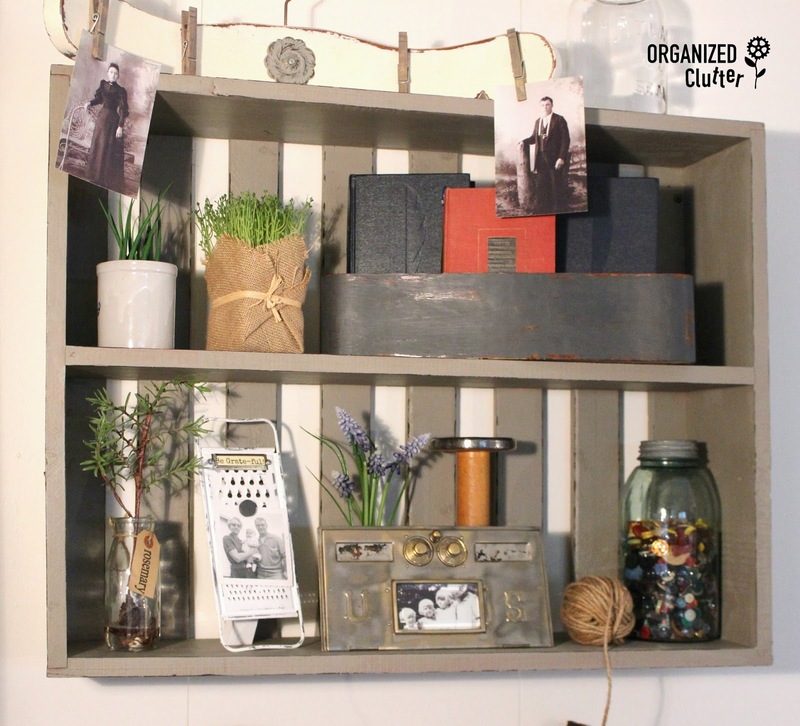 Another project with hooks, *Old Sign Stencils and an old shutter. Dated floral boxes get a makeover with paint, stencils and the Plaid Layering Block. 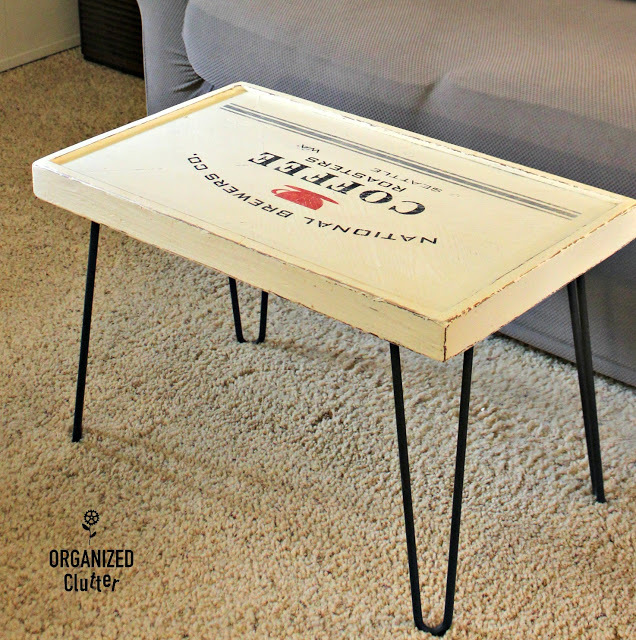 More Old Sign Stencils to transform a thrift shop coffee table into a Coffee Themed coffee table. I updated an old shelf with paint and the Plaid Layering Block. 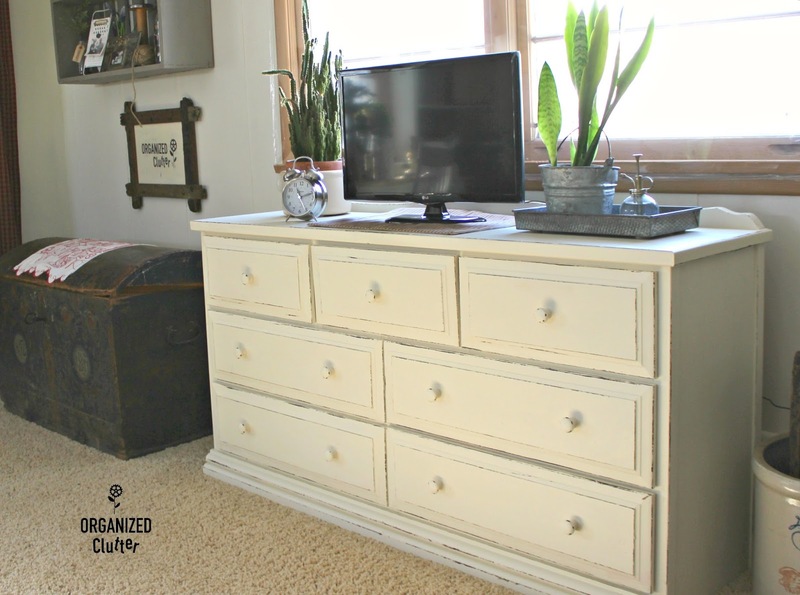 I painted several pieces of furniture with Annie Sloan Chalk Paint in Old White and distressed them with the Plaid Layering Block. Much easier than sanding. Craft supplies are stored in the painted dresser. 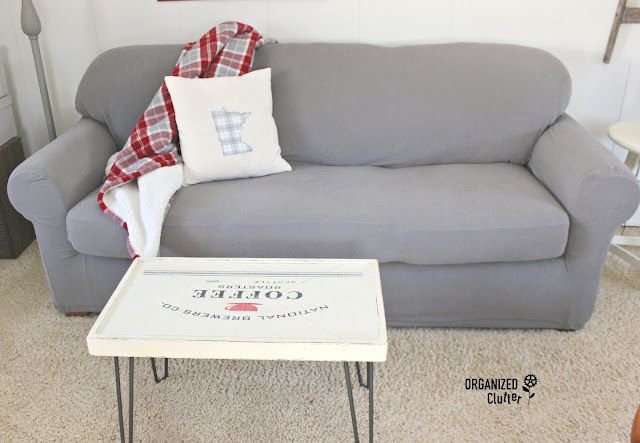 I updated the blue plaid sofa that I have had about 10 years with a Surefit two piece stretch slipcover. This is my second stretch slipcover from Surefit. They fit well and don't move around. The makeover was fairly inexpensive. I purchased the slipcover, two throws, a pillow, and new bedding. Everything else in the room, I already had or got it at a thrift shop. This is the den area. I like the gray and red with white walls. I hope to put a new floor in soon. That will cost a little more than this $500 makeover. The makeover has made the room light and bright. Craft and blog supplies are stored in the dresser. Many of my blog props for staging are on display on the shelf. The old trunk is a Norwegian family heirloom. This little cupboard was mine as a child. It was originally plywood and had been painted a few times over the years. 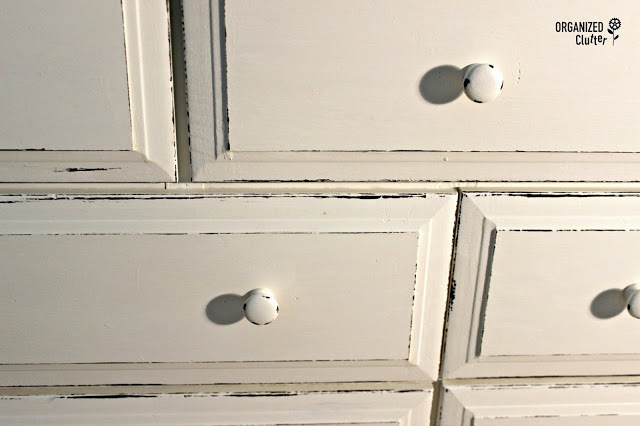 For the makeover, I painted the entire cupboard with Annie Sloan Chalk Paint in Old White. Even the yellowed laminate. Then I set the cupboard on top of the built desk/storage on one end of the den. 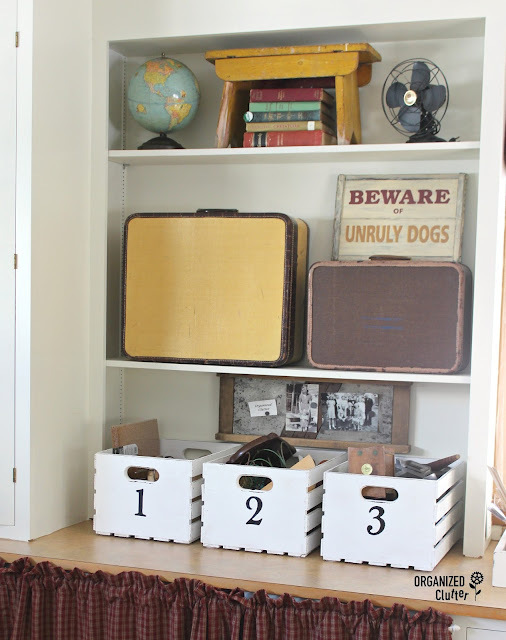 I have a lot of crates that I use for my blog and decorating. 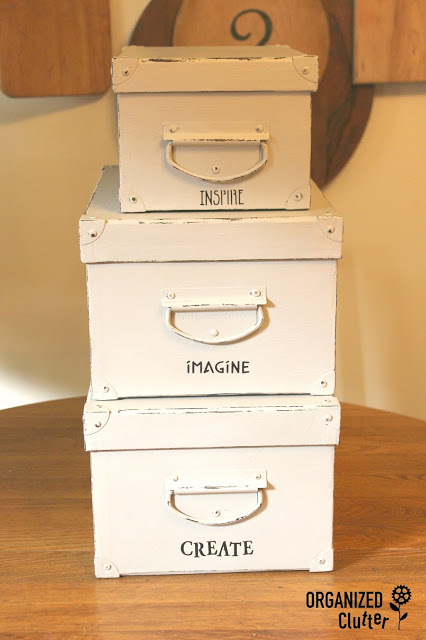 The lunch boxes are great for storing all kinds of craft supplies. 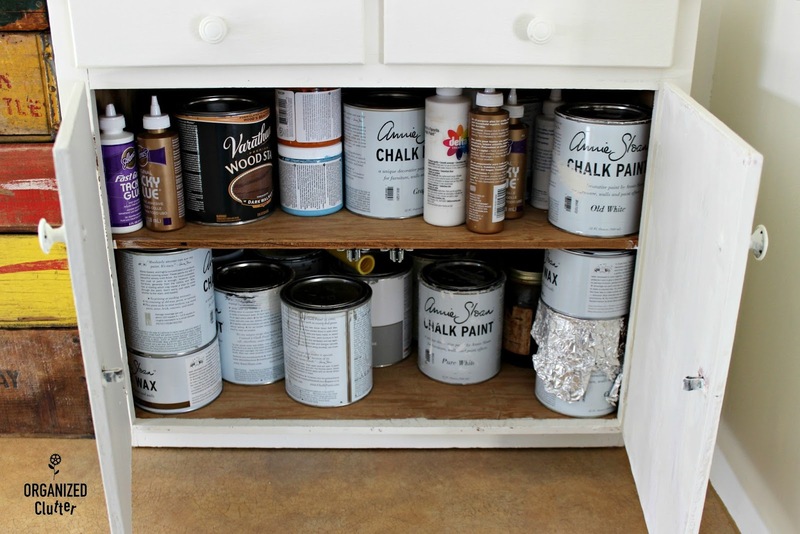 And the little cupboard holds craft paint and quarts of chalk paint and Fusion Mineral Paint. 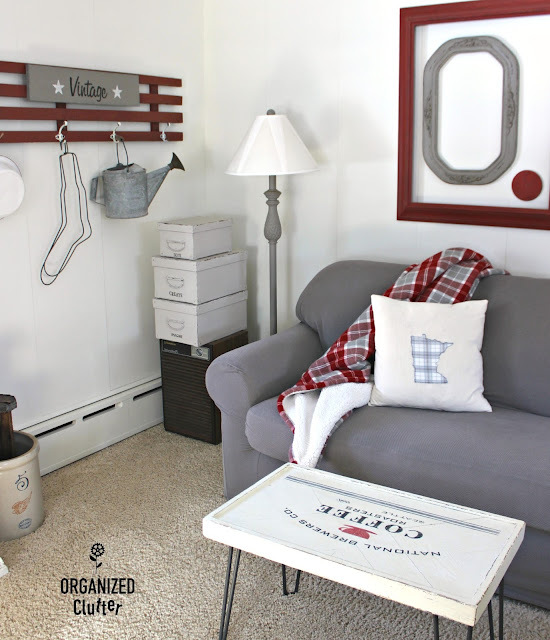 The small cork board was stenciled with the Bingo Old Sign Stencil. I was able to re-use the red curtains over the closet, storage areas and windows. The ceiling has painted beams crossing it. The room is 16 1/2' x 22'. I purchased three pine crates from Menard's and painted them white, distressed them with the Plaid Layering Block and stenciled on numbers. The crates have bits and parts for projects. The suitcases are holding my vintage linens. 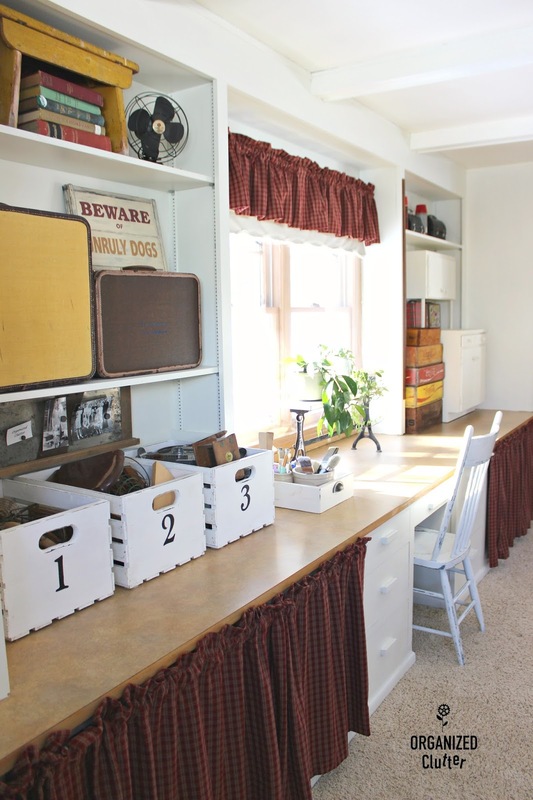 Below the counter are storage areas filled with craft supplies, and seasonal decorations. This is the guest room area. This is a vintage iron bed that I painted in Annie Sloan Chalk Paint in Graphite. The bedding is from Overstock Eddy Bauer. That's it, a very inexpensive makeover! I hope I gave you some storage and inexpensive decorating ideas. 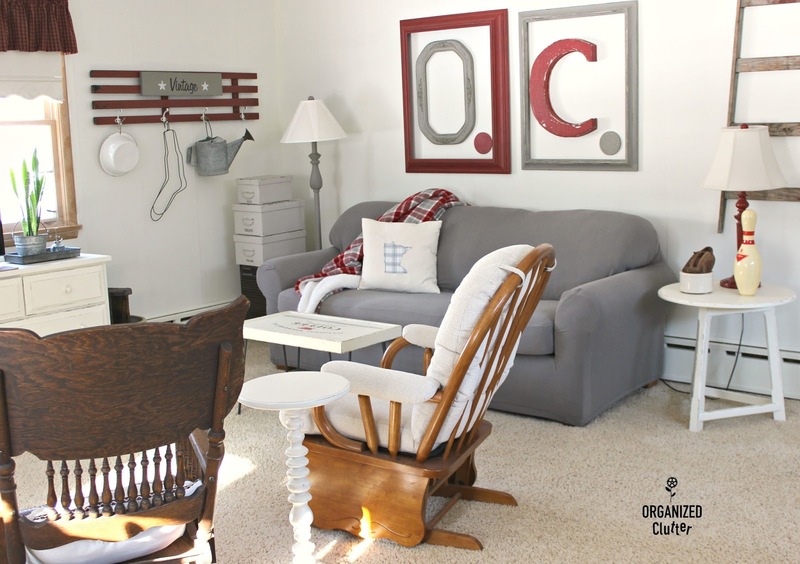 I love how you refreshed and revitalized the space, Carlene. The colors are wonderful and bright, and I love how you used your projects to organize everything beautifully! The Norwegian trunk is a treasure! I love it, what a fabulous room and such a great use of space. Your room looks amazing!! 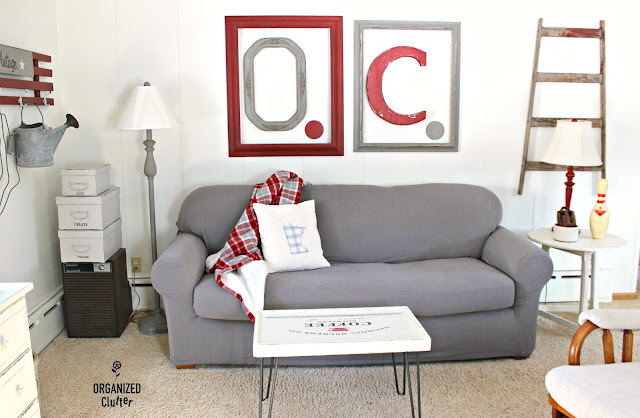 Isn't it great how a can of white paint can transform a room and make all your fun things show up better? Love it Carlene, nice job! You've been a busy little bee! This looks great! I love your new colors with the pops of red. Lots of organizing going on too! GreAt ideas. It looks nice and not cluttered. I like the colors of scarlet and gray. What a great room for many purposes. 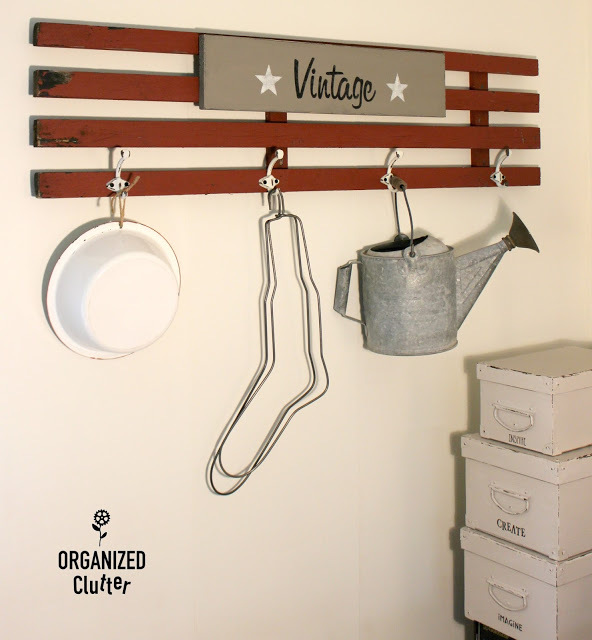 You have organized everything so that it is useful for your projects, blogging, guests, TV watching. Lots of work, very welcoming room. You are an inspiration for a room or two I have in my basement. 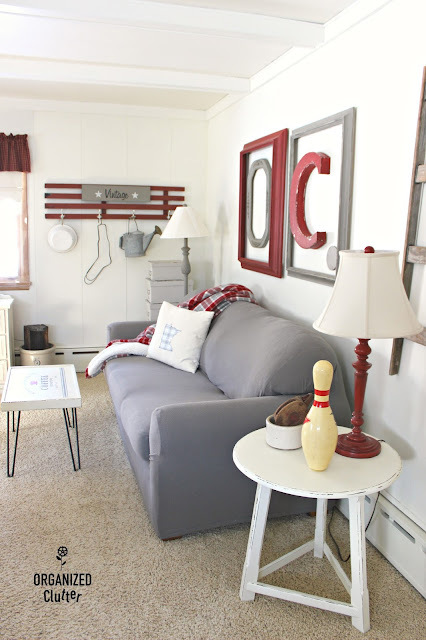 I could also be inspired to add a guestroom in an upstairs office....and I will aim toward your colors as red and gray combo is a favorite of mine and you nailed IT! Looks great, tis the season to redo and update this direction also. You have fun accent colors. And I like the base of Old White. Thanks for the inspiration. Love it. It looks warm, inviting and comfortable. I'd enjoy just taking in all your decorating ideas if I visited. Good job. 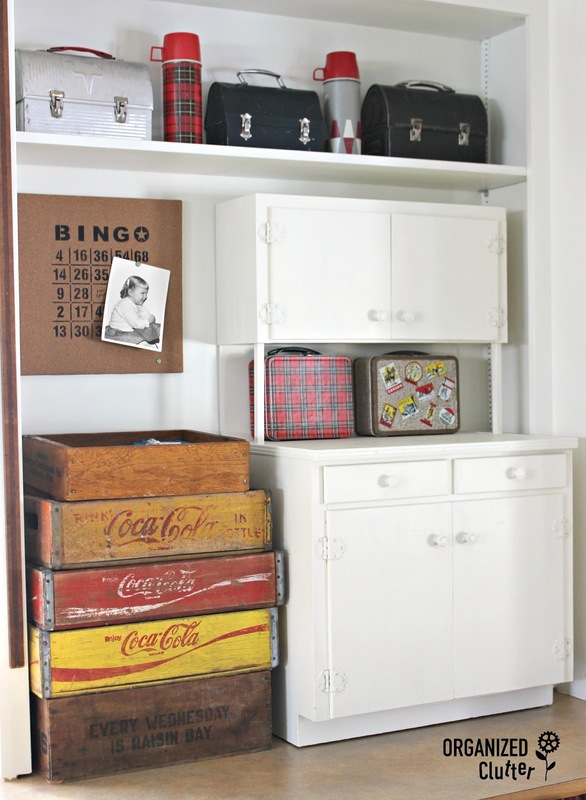 Those crates are a great idea for a lot of purposes. WOW! I love this makeover. I'm working on my craft/spare room and I'm inspired. I don't have a large room but I've gone with the white, grey and red colors also. If I ever get it finished I'll share on my blog! What an awesome room! I love how it all came together, and the colors are perfect. If mine, I would spend lots of time in this room!! Looks great! You are so lucky to have a nice big space to work in. 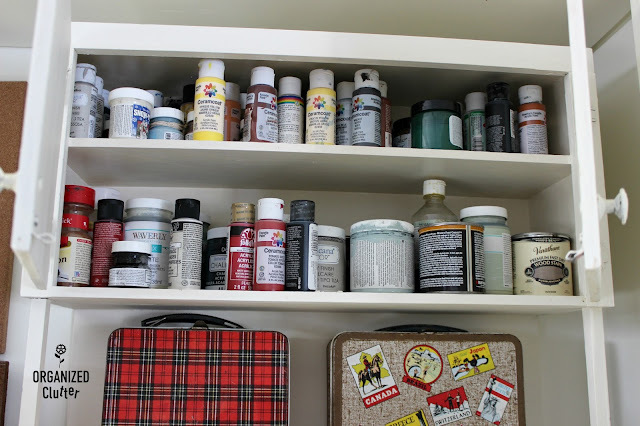 I have been putting off organizing our spare room which also serves as our craft/storage room because it is so small(like 9x10 small) and so messy. You have given me some great ideas and inspiration to try and tackle it. Thank you! 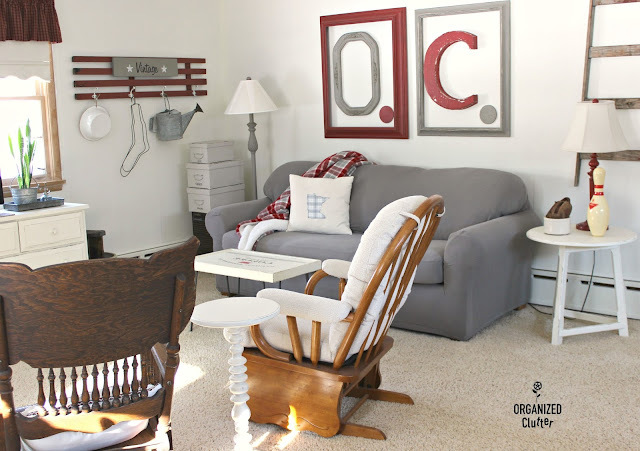 A beautiful make-over and a really inspiring and helpful blog! Wonderful make-over and a very inspiring and helpful post! what a great space. It sure helps to have a organized and inspiring space to work in.